Rod Clement Review: If you were to read the text of Just Another Ordinary Day alone, without the illustrations, then Amanda is a normal schoolgirl with a regular, mundane school day routine. She rises from bed, then gets ready for school. Her day is punctuated with everyday, humdrum, and completely normal school activities. But this is a Rod Clement book, and nothing is ever 'normal'! The deliberately tedious and dull text is matched with enormous double page illustrations of Amanda's 'routine.' For instance, her science teacher is a giant, man-sized fly who has a vast array of beakers and test tubes busily frothing away. At the beginning of the story Amanda is roused from sleep, not by an alarm clock, but by a huge Arabic man - straight out of Aladdin - who strikes a huge golden gong. She swoops down to the kitchen table from her bedroom atop a mighty cliff, dressed in a combination of medieval armour and ultra-lite glider. Amanda forgets her school lunch, but it's ok, because she has enough coins to buy lunch from the school cafeteria. Good thing too, for the cafeteria has a huge banquet of towering hamburgers, strawberry encrusted chocolate cake, and a three tiered rack that features piles of juicy grapes, apples and pears. Oh, and a school lunch is never really complete without a butler delivering the food to you while you rest in splendid chairs at a long table. My favorite two page spread demonstrates what happens to Tilly Wyman when she upsets the library teacher, Mrs Billops. Books with brown dust-covers magically transform into the prow of a pirate ship. The waves that lap the hull are made up of green and blue books that heave against the sides of the ...er, ship. Tilly Wyman is made to walk the plank. She looks back beseechingly at the pirate captain, Mrs Billops, who has no mercy for gum chewers in her class. Mrs Billops, with a harsh expression, points only at the water. Tilly Wyman's fate is sealed. A watery grave awaits her. The line 'Mrs Billops was very upset,' is very funny in this context. 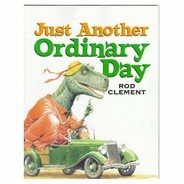 Just Another Ordinary Day is a terrific, fantastical and humorous book that introduces the concept of irony to young students. The seemingly mundane text works beautifully with the lavish illustrations to produce an hilarious 'ordinary' day in a girl's school life. Recommended for students aged 7-9.